OdorXit Air Quality Manager (AQM) is a 1 to 30 day gas release packet for enclosed areas. It works in any enclosed area. Just open the packet, add water, turn a fan and walk away! It’s that easy. 30 Day Mode - produces small amounts pure chlorine dioxide gas for 20 to 30 days (depending on the amount of humidity). The odors are gone. The OdorXit AQM CLO2 used in 30 day mode – the same packet as used in the one day mode just adding more moisture - allows you to be in the room while it's working. There's no problems with breathing this product when used as directed. 1 Day Mode - same packet as used in the 30 day mode - produces 30 times as much chlorine dioxide as the slow mode and will treat smaller enclosed areas in as little as an hour and a room or house sized area in less than one day. This process is recommend for few projects as it doesn’t give the vapor time to get into all the areas where odors hide. The OdorXit AQM CLO2 used in 1 day mode works so fast you need to leave the room. 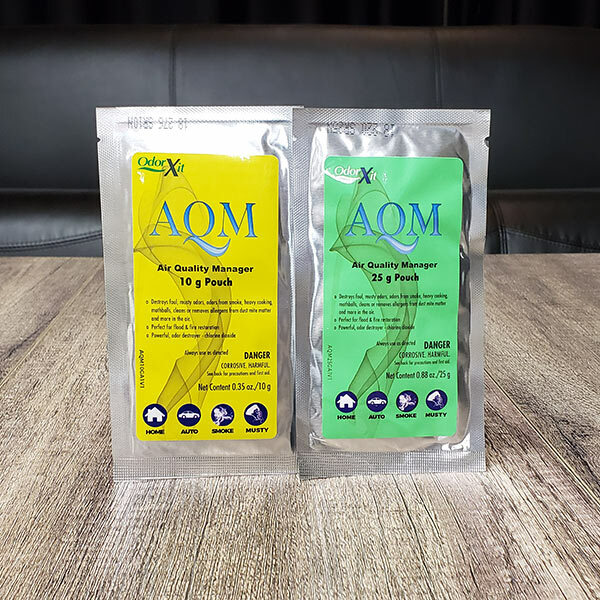 OdorXit AQM comes in 10 gram packets for areas up to 1,000 SQFT of surface area (including items in the room) OR 25 gram packets for surface areas up to 2,000 SQFT.